After a quiet night of sleep, the boys woke up excited about the match at 9am to the sound of Despacito. A relaxing shower and light breakfast followed, as it wouldn’t take long until it was time for lunch. The boys went back for a team meeting with coaches Jose and Roland, to discuss the tactics for the game in detail, ending with two motivational speeches filled with positive emotions and team spirit by Coaches Nuno & Roland. They definitely left the room inspired. 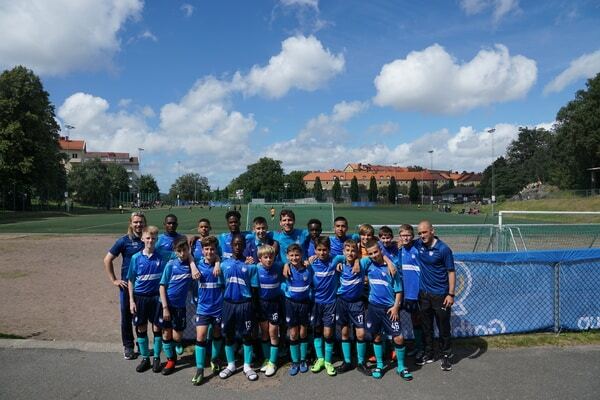 Boys packed everything they needed for the match and we headed to the pitch for our first match against the Swedish Upsala IS 1, the club’s U14 main team. On our way to pitch we found by chance Leigh, Jacob’s dad who was also on his way to watch our match. When we arrived Upsala was already warming up. 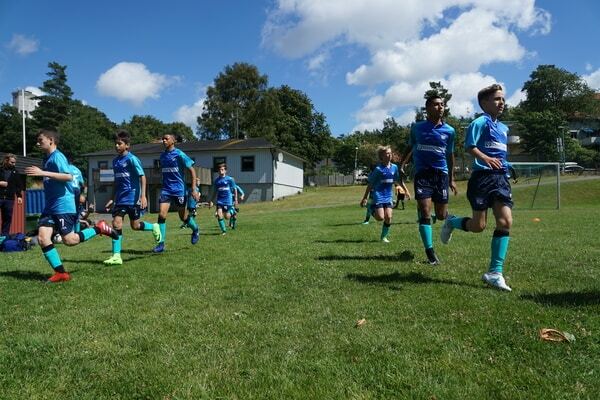 The average size of the Swedish team was much higher than ours, but footballers are not measured by size, but by ability, so the team started the match feeling confident and strong. “When the game started each team was battling to get a hold of the game, and so it was quite scrappy with lots of tackles and lots of switches of possession. However, EFA soon started to keep the ball and get into the game, moving up the pitch and creating more chances as they did this. With little pressure from the opposition Upsala IF, EFA managed to get a throw on three quarters of the pitch up. This came to Mukhtar Danmola who got his curling shot away from outside the box, and sent it into the top corner. EFA were 1-0 up. The whole team came together to celebrate the goal in the corner flag, with different celebrations and handshakes between players. There was only five minutes until half time after that and so EFA held their lead until the break, when they were able to get advice from coaches Roland and Jose. The second half started with more of the same- EFA moving up the pitch and keeping possession of the ball, creating chances which they were unlucky to score. However with high pressure from the opposition, the team began to feel more nervous, despite still playing the way they had been all game. After some well defended set pieces from EFA, the match ended and EFA had won their first match 1-0.” Thank you Peter for your brilliant comments! After the victory picture, some of the boys went back to school to have a shower and relax before dinner. In the meanwhile, the others, Jacob, Cosmo, Rex, Patrick, Jonah, Coach Nuno, Vera and Leigh headed to another football pitch to watch and support Tyler, a former teammate from the time when Nuno was their coach. Lovely to see Tyler, a very skilful player who has continued to improve as expected. 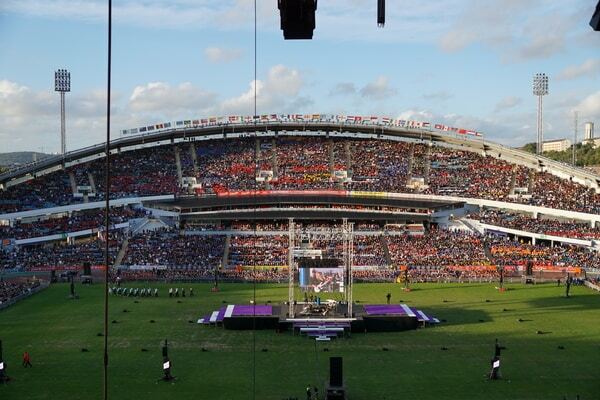 We all met at school, had dinner and headed to the Ullevi Stadium to watch the Gothia 2017 Opening Ceremony. As in other years it was a magnificent event filled with music, dancing, FairPlay videos and fireworks. After the event we came back to school as it was time for another good night of sleep.